In every business, resignation is one thing that is not being looked forward to no matter what the purpose of the resignation is. The workforce plays a vital part in ensuring that the operations of the business are continuous and at par with its set standards. Hence, any changes or shifts in the number of employees can directly impact a company. However, businesses do not have full control when it comes to the decision of their employees to resign. As an employee who is already set to resign, you have to be aware of the processes that you need to undergo so you can clear your records with your employer accordingly. 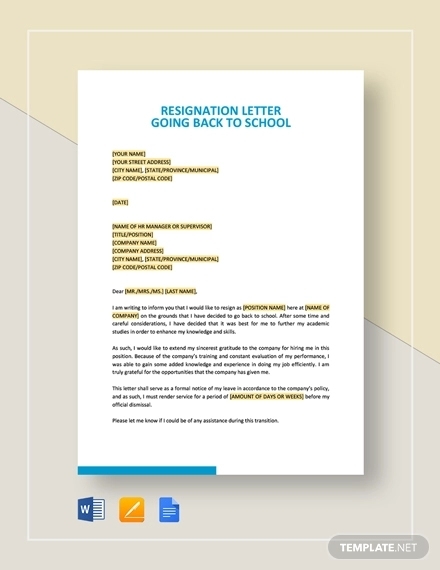 One of the things that you need to prepare is a simple resignation letter. 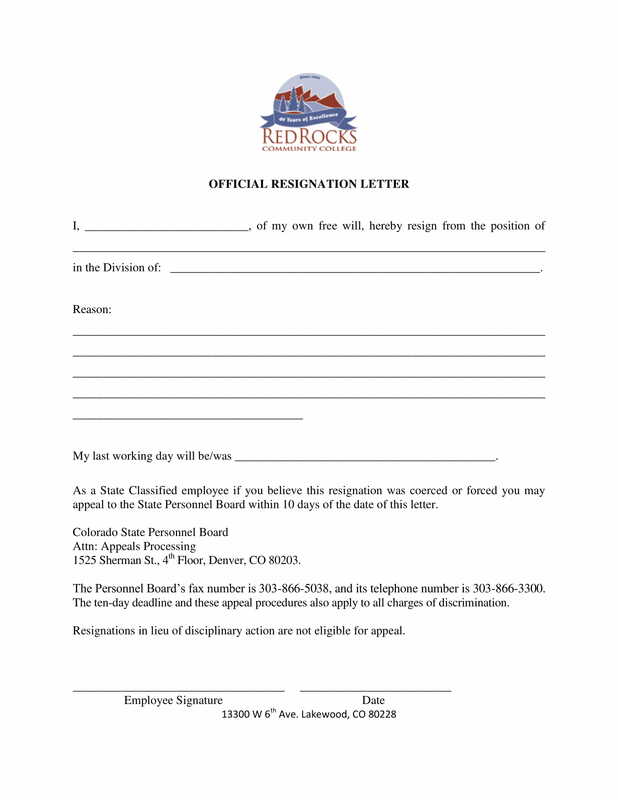 This document is needed to ensure that your exit is documented and that you have provided the notice for your decision to resign. 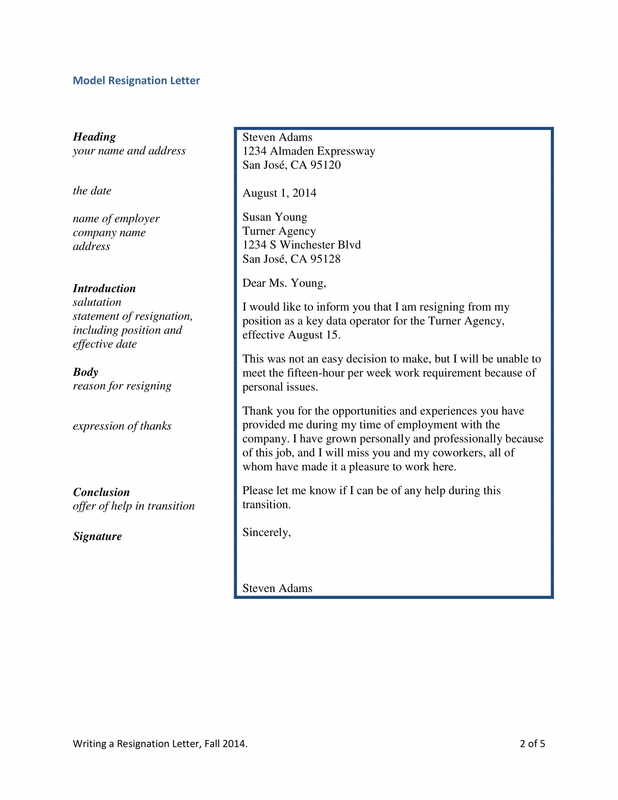 Writing a resignation letter is easy if you can be guided by samples and tips. 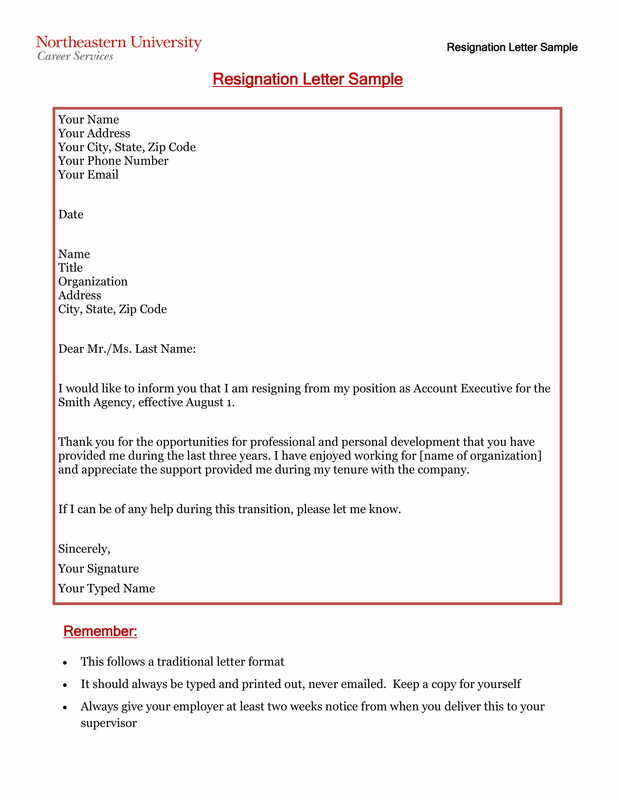 With that, you may find the downloadable resignation letter examples on this post helpful. 1. Why Do You Need to Make a Resignation Letter? May it be a temporary resignation letter or an immediate resignation letter that you will make, you have to keep in mind that making this document is not only for you to specify your desire to resign but also for you to showcase your professionalism and proper work ethics. Not all employees create a resignation letter and this decision can sometimes lead to instances like not getting certificate examples of employment or not being able to get their final pays. You have to give notice to your employer. It is not only you who need to adjust from the resignation as there are also things that your employer needs to prepare and look into. Aside from ensuring that all your exit documents will be prepared, they also have to make sure that the operations will not be affected by your decision. Writing a resignation letter is a way for you to give respect to your employer. 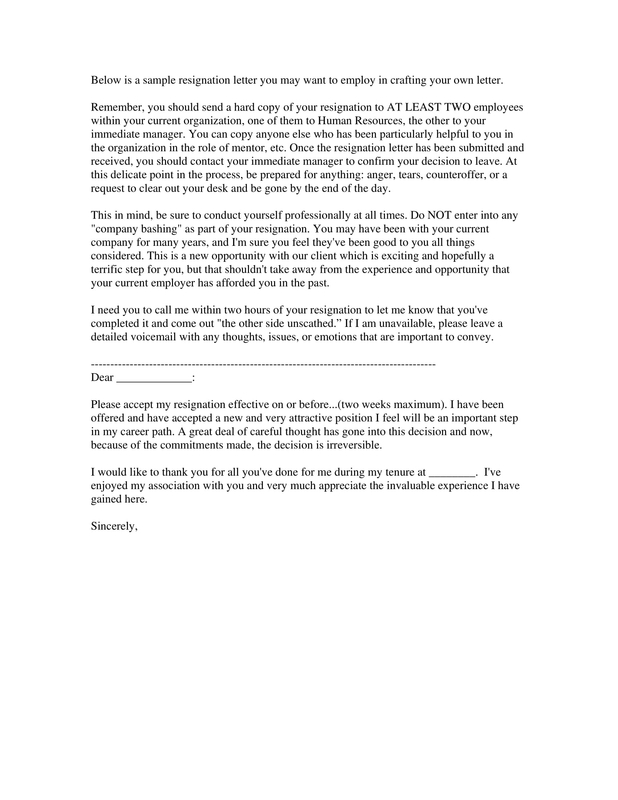 Making a resignation letter will help you to organize your exit. If you will already provide a document that can serve as a notice for your employers, then they can already prepare everything that is needed in terms of your final pay, benefits, clearances, and certificates. For you to have all the documents that you will be needing for your next work applications or any other purposes, you have to ensure that you will submit a resignation letter to your employer. If you will give a resignation letter especially if your resignation is not immediate, there will be chances that the company can have more time to screen applicants who can replace you. With this, you can help in training the new employee which is a great way for you to contribute to the smooth flow of business operations even if you will already resign. This can impact your resignation on a positive note which can make it easier for you to ask for recommendations from your employer should you be needing them in the future. Your resignation letter can be a way for you to leave a positive mark on the business. This will also help you to ensure that all your track records up until your resignation will not affect your future endeavors especially if background checks will be done by your next employer. A professional exit can always do good when it comes to your next career moves and plans. You may also see Heartfelt Resignation letter. Resignations can come in different forms. 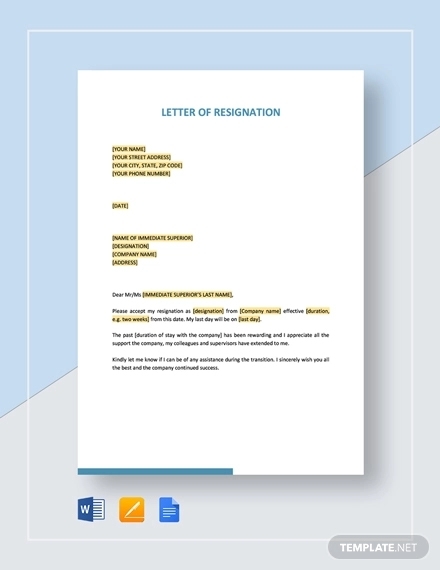 Whether it is a better opportunity or a concern about the management of the business that made you resign, do not forget to develop a simple resignation letter. 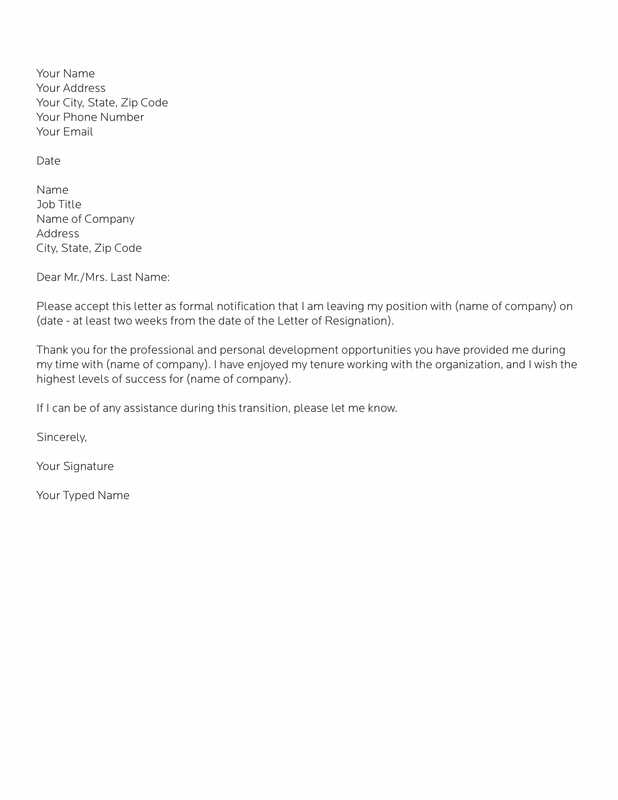 Creating a resignation letter is a professional way to relay your message to the company about your decision to leave the post that you are given with. Do you think that you are not growing as a person or as a professional in your current workplace? Do you believe that you are working in an environment that is not safe, healthy and employee-friendly anymore? Do you want to explore more opportunities outside the bounds of the company where you are employed? If you are experiencing these, you already have to decide on whether you will continue working for your employer or you will already resign. 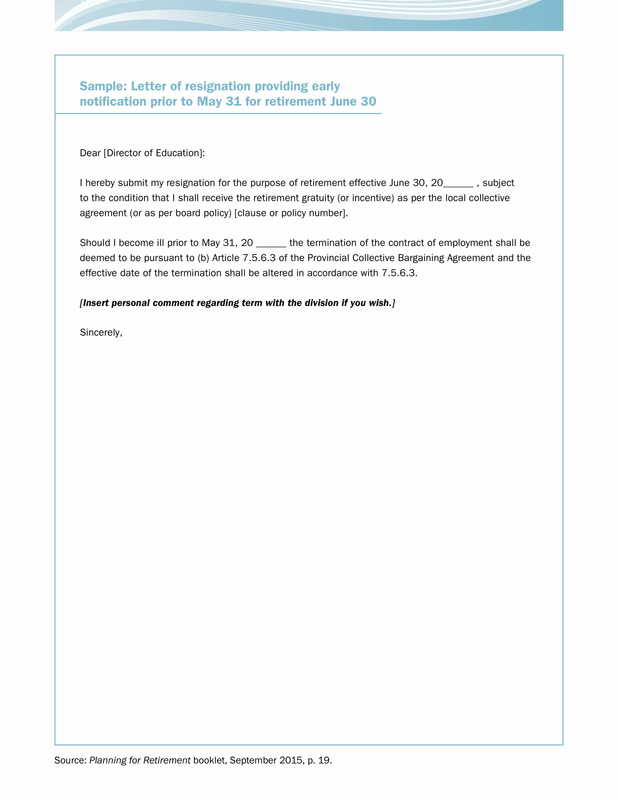 You may also see Retirement Resignation Letter. If you believe that you are already leaving the company for better opportunities, make a resignation letter. Even if your perspective or next employer can provide you with more benefits or a higher salary, it is important for you to exit your current work in a formal manner. Write a resignation letter if you are already sure that you will resign. Even though preparing a resignation letter without concrete plans is alright, it will be best if you will make the letter based on the instance that made you decide to leave your employer. Having problems with your workplace or workmates can also be a few of the reasons why you came up with the decision to resign. If this is so, wait for the time that you can already write objectively so that your resignation letter will not contain rants and other negative information. Always have a graceful exit for you to be remembered as an efficient, effective, and respectful employee. In any instance where you feel like you are already prepared to resign, writing a resignation letter should be one of your priorities. 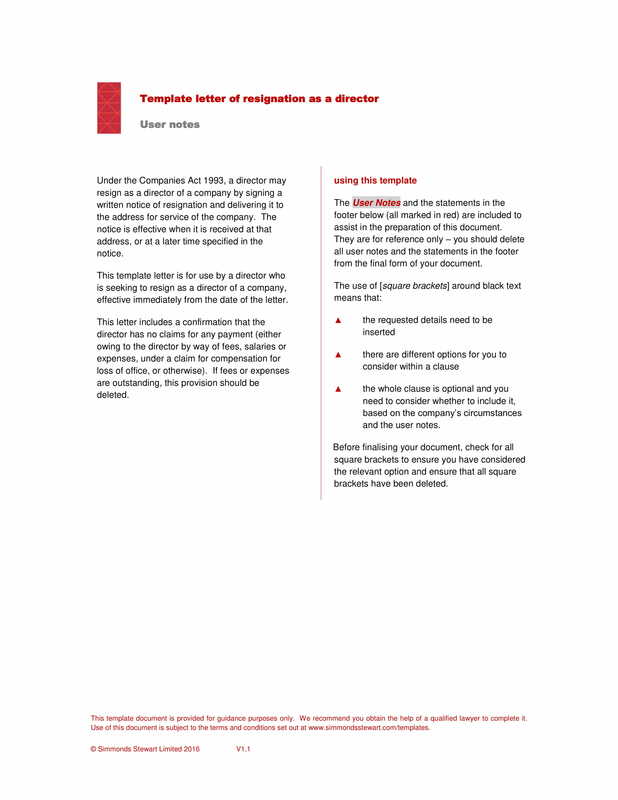 Think carefully about how you will discuss your resignation in the letter as the last thing that you would want to happen is for your decision to be taken negatively. Knowing how to write a resignation letter accordingly can help you get the support of your employer on your next professional undertaking. The creation of a resignation letter does not only focus on the information that you would like to state. How you put together these items in a structured format can also affect the impression of your employer. If you want to ensure that your resignation letter will look as professional as possible, make sure that you will find the balance with content discussion and actual presentation. Your resignation letter will serve as the last impression of you. Hence, your intent to resign should be applicable for business transactions so that it will not give you a bad record in terms of employment history. 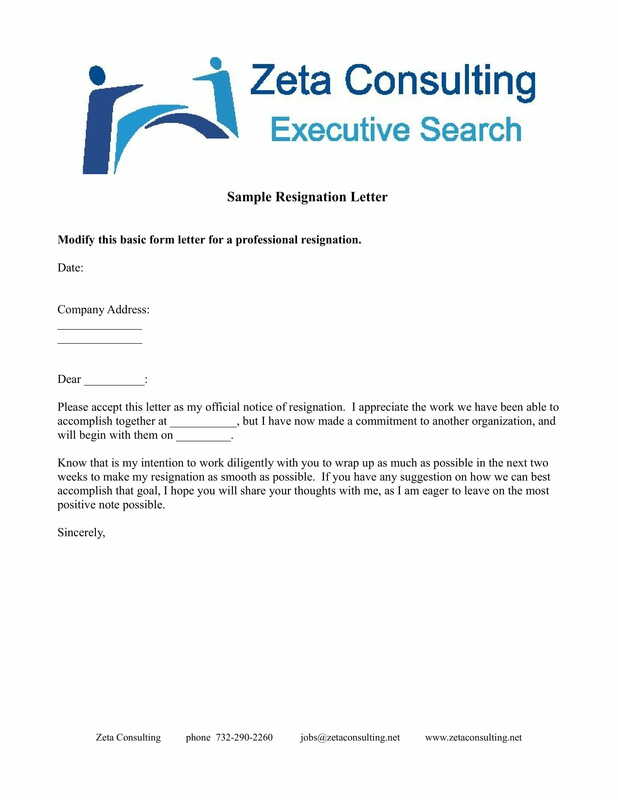 Use a resignation letter to state your resignation and not to bash the company, its operations or other employees. Remember to never burn bridges as it is most likely that you will be working with the same people in a different setting in the future especially if you will still work in the same industry. It is not always necessary to mention the reason why you decided to resign. Even if you do not specify it in your resignation letter, you can still state it in your exit interview. Doing the latter can be more appropriate as it is a one-on-one discussion with a human resource representative which can assess the weight of your reason for leaving. 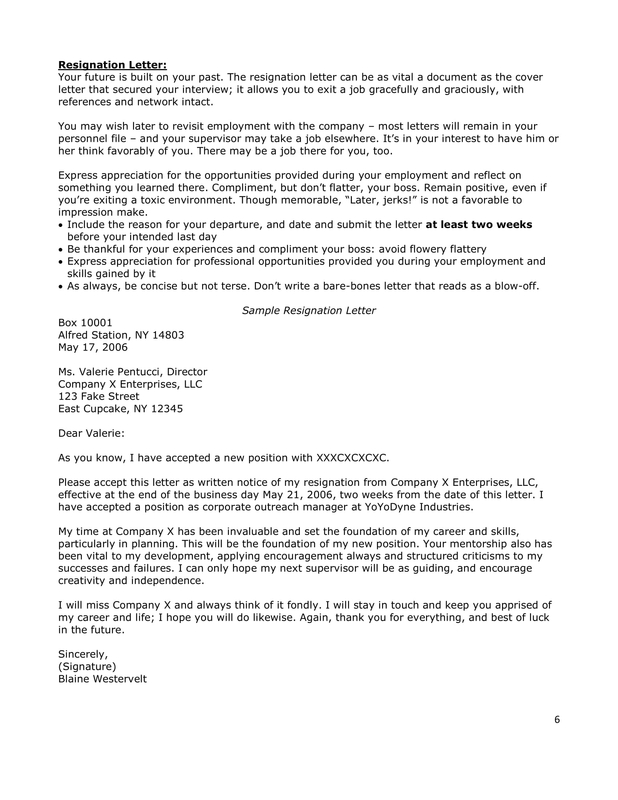 You may also see Job Resignation Letter. 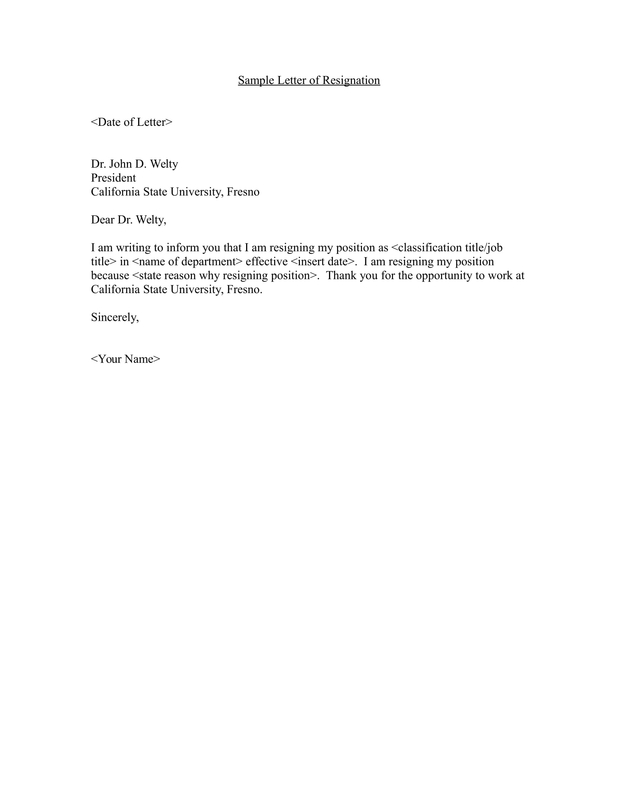 Be specific with the resignation letter that you want to create. Are you going to resign immediately? Or are you willing to render services for a particular time period before resigning based on the regulations of your business? 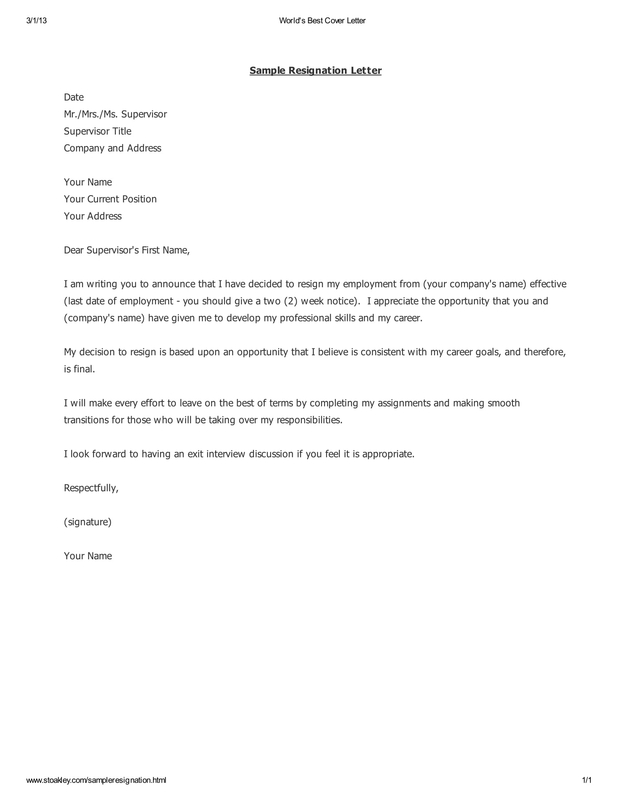 A simple resignation letter should provide the exact details that you would like your employer to know. Think of the reaction of your target audience first before finalizing the content of your resignation letter. Doing this can help you narrow down the information that you will share in a simple resignation letter. You have to be careful with what you will be saying as misinformation and other irrelevant data may be taken against you and your decision to resign. Your simple resignation letter should be direct to the point. However, this does not mean that it should not be comprehensive. 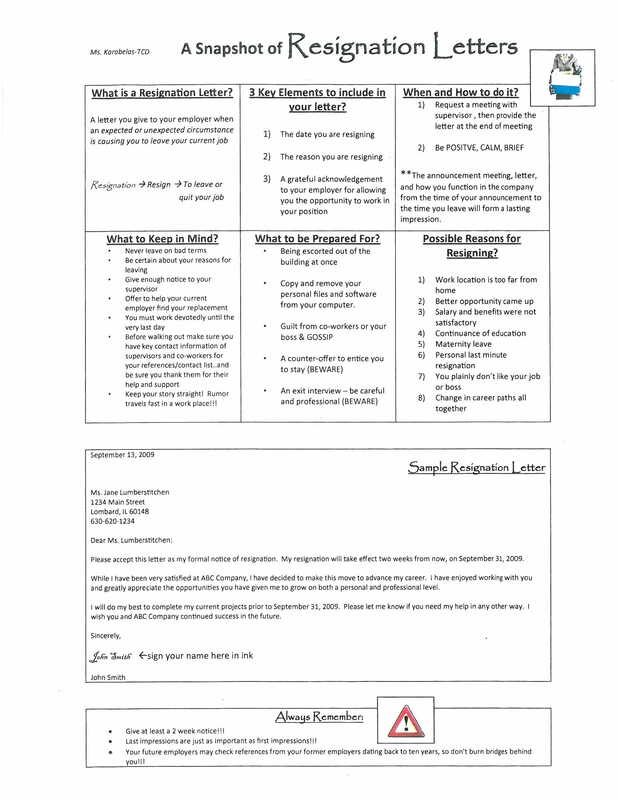 All you need to do is to ensure that you will only include necessary information in the letter. One thing that can help you a lot with this matter is the development of a resignation checklist. A resignation checklist that is specifically used to list down the content of your resignation letter will allow you to not forget any important details that you need to place in the specified document. 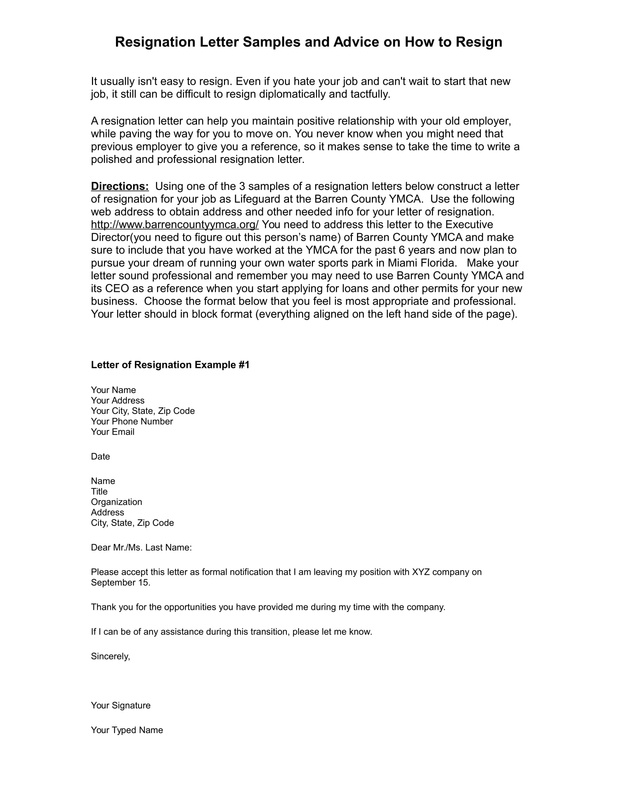 Listed below is the information that is usually expected to be seen in a simple resignation letter. These items are only the basic information that should be in a simple resignation letter. If you believe that there are still other items that you would like to include and you know that you can still arrange these items properly, then do not hesitate to write the added information in the resignation letter that you will make. 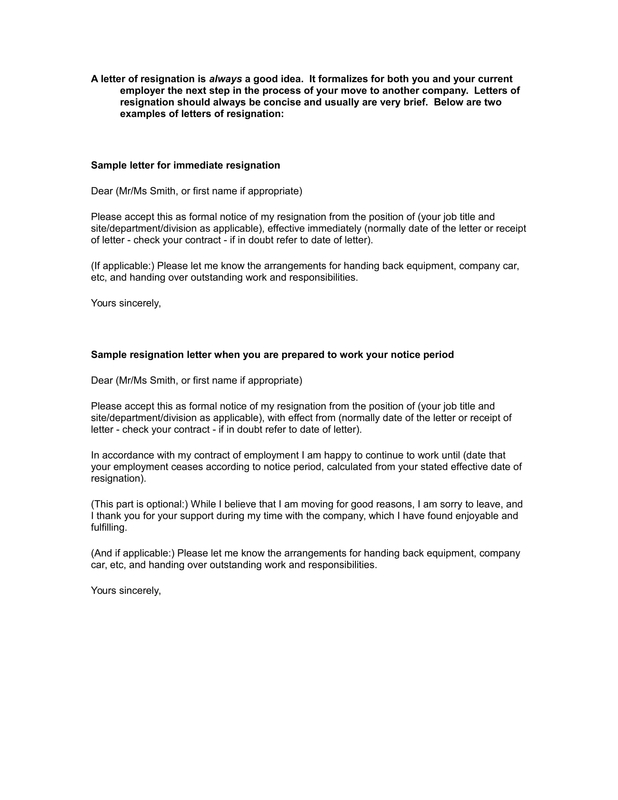 A resignation letter is both beneficial to the business and the employee if created and submitted accordingly. For businesses, knowing that an employee will already resign can help them do corresponding actions to minimize the impact of the resignation. On the other hand, employees can ensure that they have explained themselves and their decision well before finally resigning from their work designation. 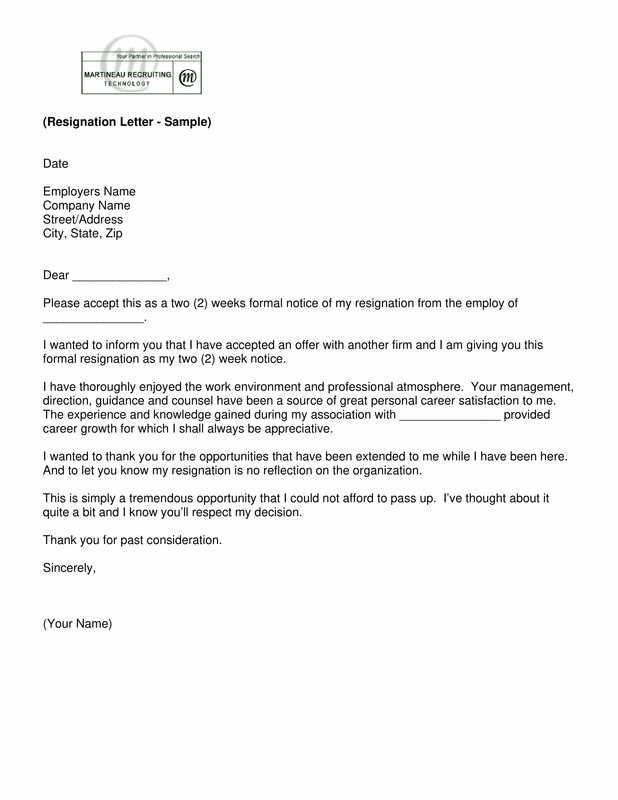 A simple resignation letter can help you directly state your decision. The absence of irrelevant information can make your employer be more focused on the actual details that they would like to know. As an example, a relocation resignation can be more effective if you will directly state that the reason for your resignation is due to migration or other reasons that will not allow you to go to the business regularly. A simple resignation letter can convince your employer that you are truly aware of what you are talking about. There is nothing more important than to solidify your ground about the resignation. If the employer believes that your reasoning is correct and that your resignation will be the best option for you and/or the business, then you can already identify the effectiveness of the document that you have created. 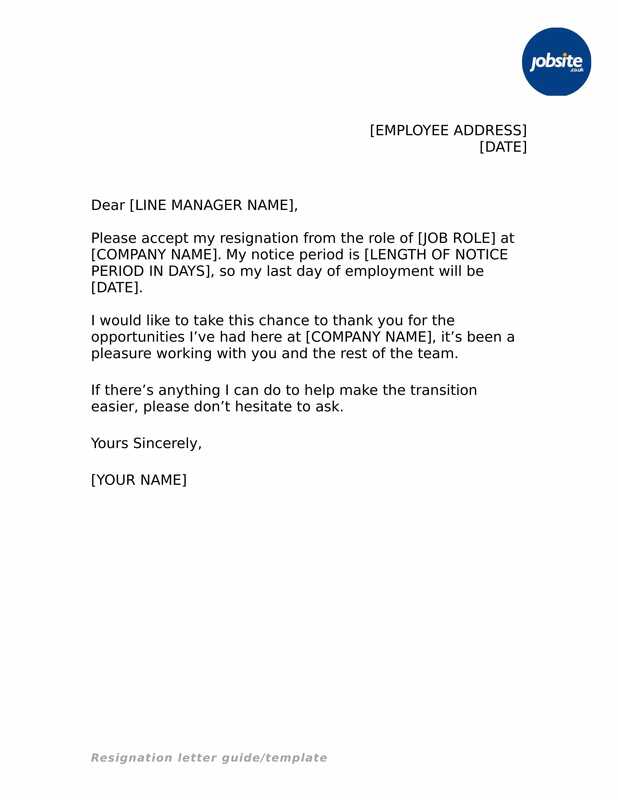 A simple resignation letter can make your decision to resign more understandable. Some employees tend to just leave the business without prior notice. This is a bad way for you to end your ties with the company. Always leave your employer on good terms as you will never know when will be the time that you need to transact with them again. You may also see Resignation Letter Examples. A simple resignation letter can help you retain your professional relationship with the business even if you will already vacate your work post. A good relationship with your previous employers can be good for you especially in terms of impressing your prospective employer. If you can present a record of employers that are satisfied with your services, then it can say a lot about how you will be performing at your next companies. Always be aware of the length of your resignation letter. 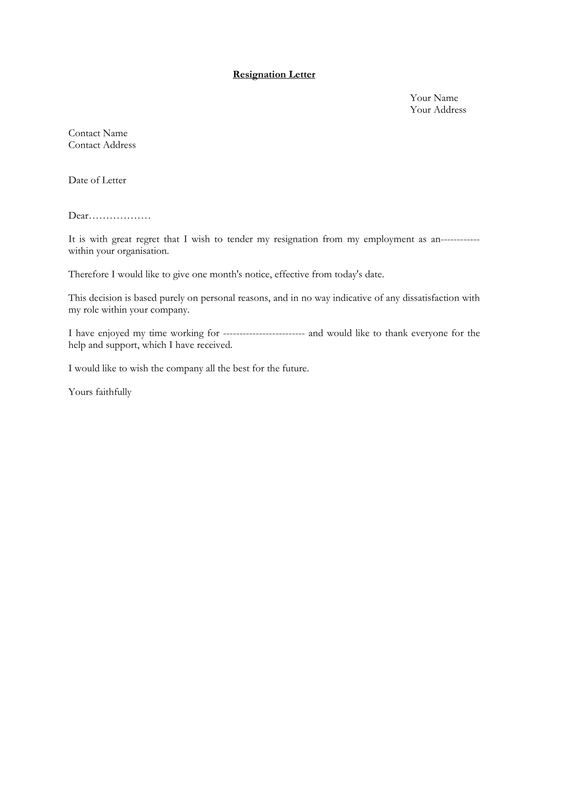 Since you are aiming to develop a simple document, you need to ensure that your resignation letter will be lengthy. 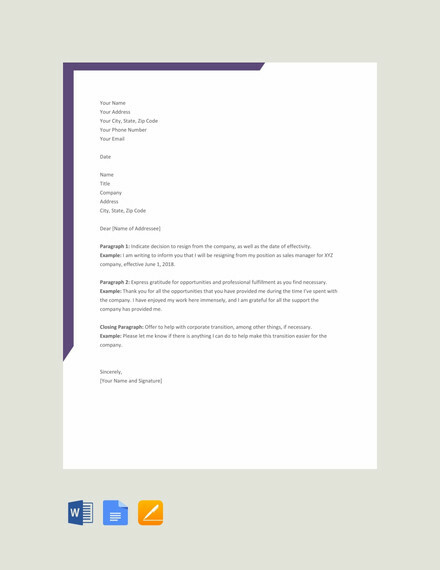 You do not need to put a lot of words in the letter as it can only make the document look cluttered and informal. 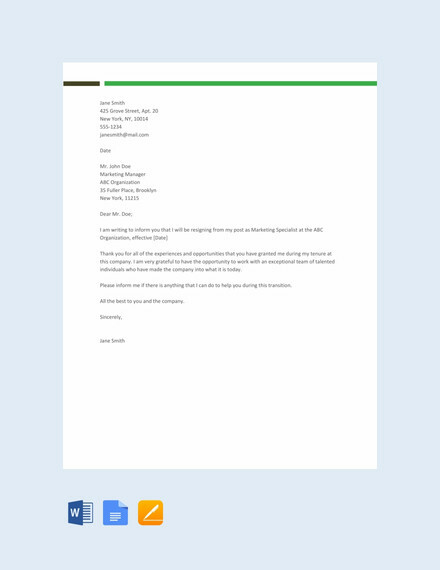 As much as possible, implement simplicity with your content so you can limit your resignation letter to a single page. Be concise with your discussion. The subject of your discussion is your resignation. Do not veer away from this topic especially when specifying the reasons on why you would like to resign already. The content flow of your resignation letter matters a lot which is why you have to be observant of what you will state so you can arrange them accordingly. Be straightforward about your decision to resign. Do not use any jargon that can make the document hard to understand. You have to make sure that your willingness to voluntarily resign is already final and that you are writing the document just to inform the management about it. Have a formal yet relaxed and friendly tone when writing the content of your resignation letter. Do not go into too many details as it can only give more possibilities of you being emotional. As a formal letter, only the business-appropriate content should be seen and observed in your simple resignation letter. If you will write the reason for your resignation, try to be as objective and as calm as possible. It is important for you to be precise with your reasons but you should also understand that the company should see your concerns as valid items. Writing the reason why you would like to resign is not necessary but once you decide to do so, remember to not drag the company down and focus on why your reason has affected you as an employee. 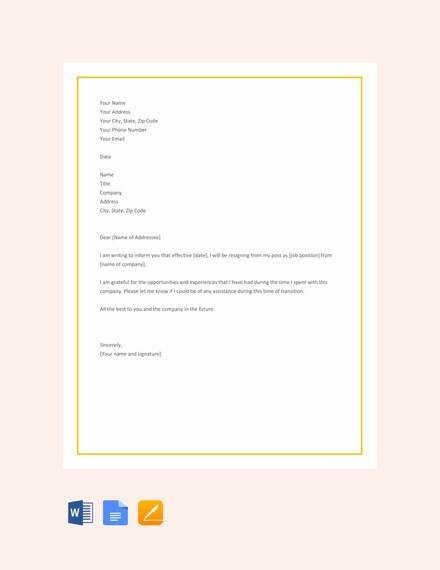 Create a simple resignation letter now so you can see for yourself on how it can affect your resignation in a way that is great and beneficial on your part as an employee. 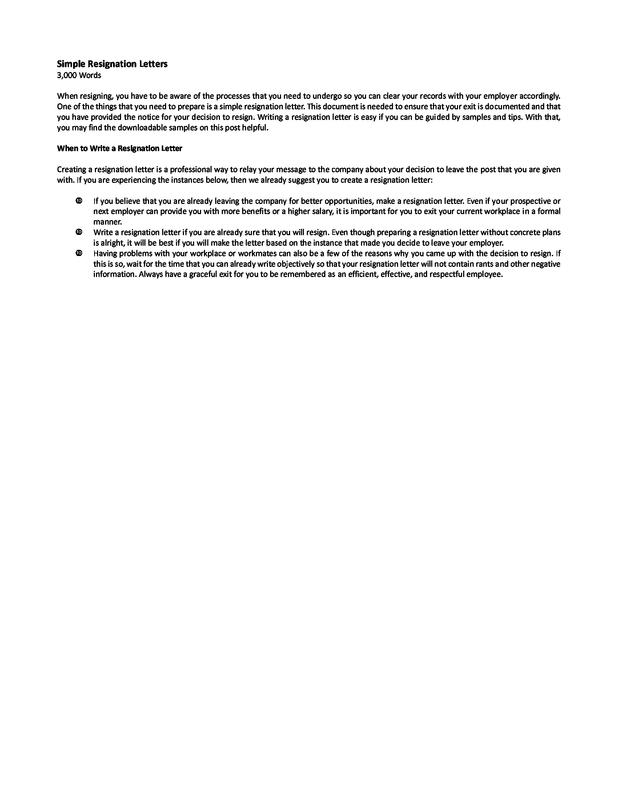 You do not need to go all out when it comes to the discussion that you would like to put in your letter. As long as you can present your desire to resign and you will do it in a tasteful manner, then you can already have a document that can be positively accepted and understood by your employer. Try to use the downloadable samples that we have put together in this post as your references. Make sure that you will refer to the samples that best fit the reason for your resignation and the time duration that you can still allot in the company as an employee before your actual resignation date. 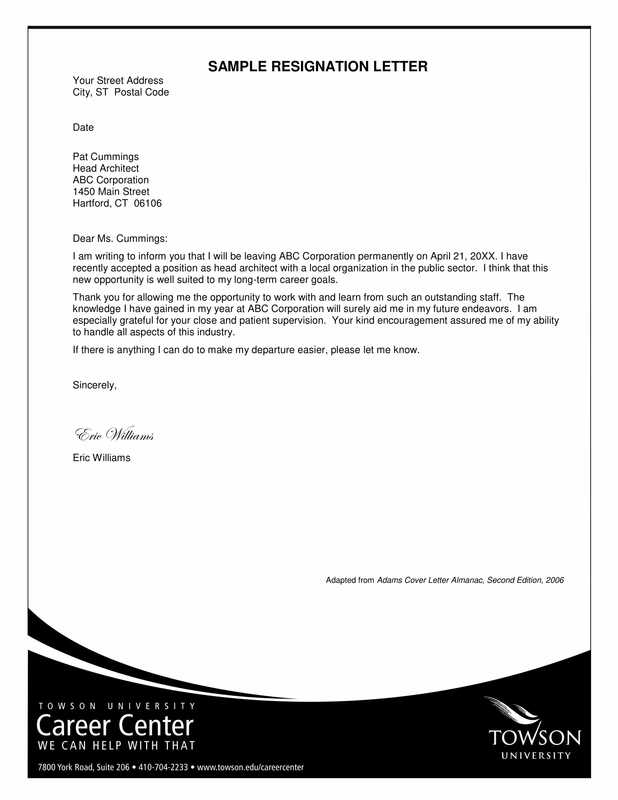 You may also see Temporary Job Resignation Letter. 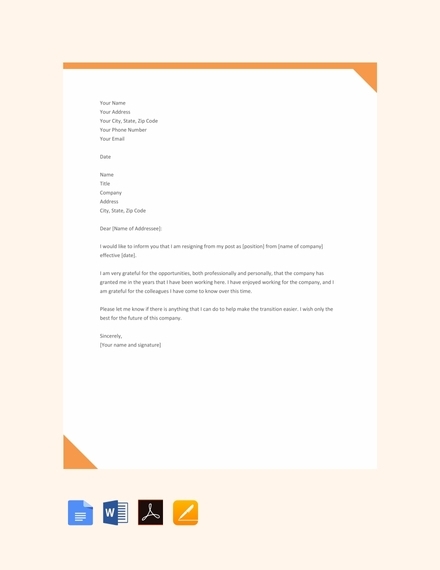 Writing heartfelt resignation letters can be better if you can concisely layout all the information of your resignation without disrespecting the company. Be keen on what you will include in the resignation letter and always review the content of the document before submitting it. 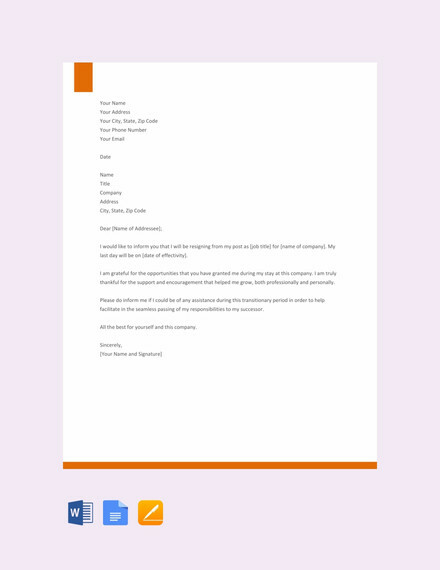 Whether you will use an email resignation letter or you will hand a physical letter of resignation, ensure that you will remember the tips and guidelines that we listed in this post. Be professional and state your desire to resign through a simple yet comprehensive resignation letter.